Elite Sprinkler Repair & Landscaping has been servicing commercial and residential clients since 1982. Our mission is to provide professional service and attention to your projects, large or small. 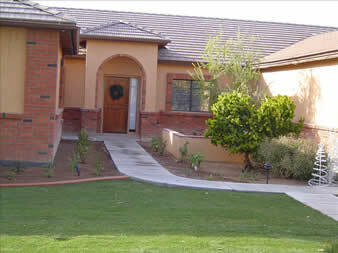 We are a full service company providing complete landscape services: Design, installation and repair. From custom outdoor rooms that extend your living space, to water features, plantings and outdoor lighting that create just the right ambiance, Elite provides your home with a completely customized outdoor setting that reflects a spectacular quality of life. At Elite, we are committed to making sure we deliver everything we promise. Our design staff can layout and design your landscaping, always keeping in mind the look you want to create, as well as your budget. We also offer sprinkler services including sprinkler installation or sprinkler repair. Elite Landscaping & Sprinkler can design and build your custom barbeque, flagstone patio area, edging, sod play yard, or low maintenance desert garden.